Trikes and (odd) bikes. : 28th July 2017 What? No electric balers? Friday 28th 52F, 11C, a bright start but rain forecast. Possibly thundery. Still holding off at 10.30. I rode to the shops early and back in a stiff side wind which felt more like a head wind. Only 7 miles. What to do when your huge lawn "gets away from you?" Just invite a small, local farmer to come in to cut it and bale it. Ponies are still the favourite, robotic lawnmowers, however. All you need is to plug in a coal-fired, electric fence and contact a bale dealer. Classic American cars are very popular in Denmark. I have heard rumours that the Danish government has access to a large and immaculately maintained fleet of these gas guzzlers. They are mostly used for kommuting [sic] back and forth to EU climate meetings all over Europe. Well, somebody had to put their foot down. All the private jets were having difficulty finding local parking at these posh banquets. It is good security cover too. For all the staff who have to protect the politicooze from themselves. Seeing 50 classic American cars go past looks like just another meeting of like-minded, petrol heads. Not far wrong, either. A micro, Petrol-head snail crashing the slug, drag racing scene on local roads. There are probably fewer electric cars sold here than Ferraris or Lamborghinis. Both of which are rarer than unicorn droppings on the local, Danish highways. A few Porsches with German number plates roar past occasionally. I have seen fewer supersportscars here in 20 years than I would normally see daily in a city like Bath in the UK. 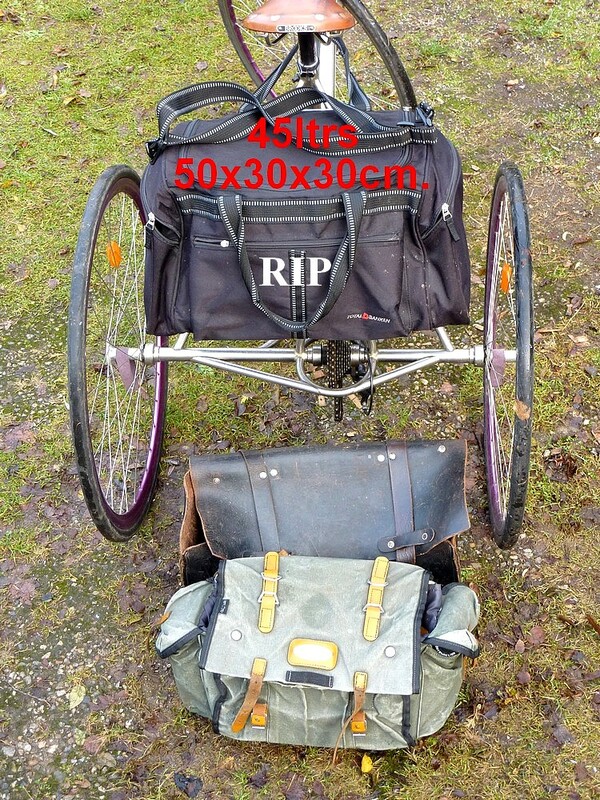 Mind you, lightweight trikes are probably even rarer. Which probably makes me a bit "special." 😉 I had better glue a unicorn horn onto my cycling helmet and hang a bag for collecting droppings on the back axle. Somebody on eBay is bound to want some for their roses. Saturday 29th 58F, 14C, heavy overcast, windy and raining hard. Expected to clear up later. I'm not holding my breath. It did eventually, but I didn't. Sunday 30th 66-74F, 19-23C, light breeze, cloudy but bright intervals. The sky went black and there was a massive, thundery cloudburst after 11am. A flock of some 30 swallows were flying around quite normally amongst the falling "stair rods." No cagoules? Not even a snorkel and flippers? An emergency poncho? Apparently not needed. I had hardly managed a hundred yards walking along the road when a pretty Bambi head popped up from the crop. We exchanged moist, wide-eyed stares for a few seconds and then it bounded off. Jumping high to avoid damaging the crops? Or avoiding catching its hooves in the dense stalks? It left no clear message as it quickly gained the summit of a small rise and vanished. My attempts at capturing the creature were thwarted by slow response times. Both by camera and operator. Then I played tag with a hare. Which seemed determined to remain at the limit of my TZ7's modest zoom range. If you stare really hard at the picture the hare is seen mesmerized by a large red arrow floating in the air just above it. I wish I could claim the arrow had something to do with the crop circles. But those visible are only spray tracks following GPS guidance from above. Later a ride to the shops in breezy conditions. Despite the towering, cauliflower clouds, the sun seemed to shine constantly on our tricycling hero labouring along, down below. As I carved a short route along the glittering valleys between local thunder storms. At 74F it was strictly bare arms and bare legs, shorts and cycling jersey perfection. Only in the forest did the temperature seem to fall suddenly. Elsewhere it was nicely steamy. However it was not all positive. The ex-local bank, sports bag, which I have used for literally ages, finally and catastrophically let go of its 180° roof zip. I am now bereft and bagless. It was so perfect too! 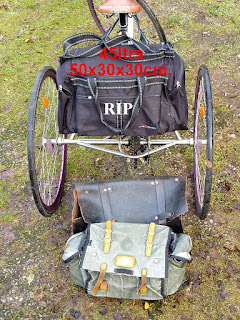 Its 50x30x30cm fitted my trike to absolute perfection. It lay over the Carradice Camper thanks to perfectly proportioned and comfortable, cloth loop handles. A generously proportioned shoulder strap was just the gilding on the lily. I loved that bag despite its jet black exterior [and interior.] Magenta or burgundy would have been nice for a bit of understated bling. That would have given me more street cred as I danced around my bag outside the supermarkets. Alas, poor bag, it is no more..
Alas, the local bank, where I obtained my prize, free of charge, is no more. The entire rank of struggling shops and small businesses has been entirely erased by a very large excavator. Leaving a naked eye view of a once hidden, but now extinct, rural sorting office and downgraded, equally rural, bus station with extensive cycle parking. One hardly likes to think of the wind whistling across here without the natural windbreak provided by this [now missing] terrace. What will all the teenage drunks and druggies do now for shelter [from inquisitive eyes] on those long, summer evenings? What plans they have for this heavily trafficked, high street situation is as yet unknown. Well, not to me at least, but I don't take the local [advertising] paper. It's nothing personal, but I am still heartily afraid of "going native" after all these years. And that would never do. I don't even like most Danish beers. While [intensive] pork frikadeller with sauce [the Danish national dish consumed at precisely 18.00pm daily] would make me psychologically retch. And I have more than enough personal problems already. Not least finding another free, 45 liter, sports bag! Preferably in understated Burgundy or magenta. But beggars can't be choosers.